Your favourite chocolate flavour pudding is ideal as a stand-alone dessert, but can be used as well as a basis for numerous desserts and sweets due to its texture and taste. 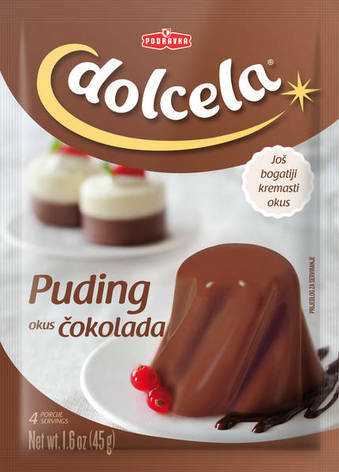 Divine chocolate, in melting, rich and seductive chocolate pudding will be even more intensified if you add a few cubes of chocolate into the hot pudding, pour the pudding with whipped cream or sprinkle with grated chocolate. With the chocolate pudding you simply cannot go wrong. Instructions: Combine pudding mix with 4 tablespoons (50 g) sugar. Of ½ L cold milk, take 6 tablespoons and add to pudding and sugar mixture, mix well. Cook remaining milk, remove from heat and add in pudding mixture, and cook an additional 1 – 2 minutes, while stirring.... show more Instructions: Combine pudding mix with 4 tablespoons (50 g) sugar. Of ½ L cold milk, take 6 tablespoons and add to pudding and sugar mixture, mix well. Cook remaining milk, remove from heat and add in pudding mixture, and cook an additional 1 – 2 minutes, while stirring. Pour hot pudding into damp dishes and leave to cool. When done garnish with whipped cream "Dolcela", chocolate decorations, fresh or candied fruit, fruit syrup, juice or compote. Ingredients: corn starch, fat-reduced cocoa powder 15 %, chocolate (powder) 1% (contains soy lecithin), table salt. Storage: Storage: keep in a dry and cool place.